Tuesday is really a bittersweet memory for me now. There were highs, lows and everything in-between. It was a long, beautiful, BRUTAL day and I learned some very important things about myself here. This is where I LOST the competition. 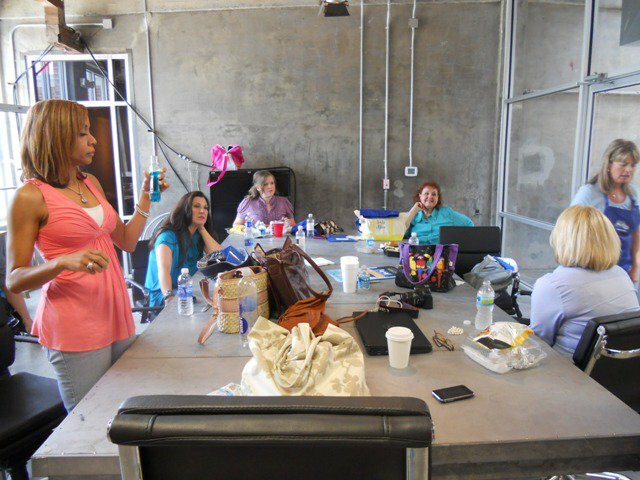 Since the dessert finalists were the last people to cook for the day, we didn't have to arrive at Meddin Studios until about 1:30 pm. We weren't scheduled to cook until 5:30 pm, so I knew that there would be lots of waiting and watching. I was hair and make-up ready right on time, and as soon as we arrived at the studio, I already felt some of my nerves lift. Showing up was half the battle...the easy half. They had lunch ready for us. Even the sandwiches they brought to the studio were amazing! I loved that everyone REALLY thought about the food that they served us on this trip...after all, that's what this whole competition was about, delicious food. My grilled chicken panini had basil, tomato and cheese oozing out the sides and the chicken was perfectly cooked and perfectly seasoned. It was a good thing that Jules from http://www.dollfacebyjules.com/ was there to keep us looking beautiful because my lipstick was gone within the first few bites! Audie had informed us that we would be doing some interviewing while we were waiting for our cook-off. She would be asking the questions and it would be fairly informal, so I was really pretty excited about that. We were doing a short photo shoot with Josh from http://www.jabberpics.smugmug.com/ first, then a "pre-interview" before our cook-off, and a "post-interview" after we had presented our dishes to the judges. The side dish girls were finishing up their pre-interviews when we arrived and soon began their cook-off. It was great to see the girls finish before us because they were giving us great words of encouragement and advice. They kept mentioning how easy everyone was to work with, how pleasant the interviews were and how the production staff was VERY easy-going and helpful. This wasn't going to be like a cooking reality show where you're given 60 minutes and that's IT. No hands tied behind the back at the time limit, no harsh judging, no horrible criticism and no manipulation by other competitors. This was great news to me because I knew exactly what I wanted to do. 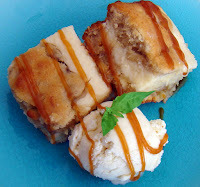 I had practiced my dish about a dozen times, and each time I learned something different about my recipe. Today I wanted to prep my dish in 16 minutes, cook my dish for 33 minutes, let it sit for 5 and then plate up my 5 servings with the remaining 6 minutes. It was a tight 60 minute schedule, but knowing that I had all the time I needed was a great comfort. They REALLY wanted everyone to give their best presentation and were willing to give all the support we needed to get there. As the competitors, we felt that way also. I certainly didn't want to win because someone else screwed up. I wanted to win, because I was the best person for the job. I had my make-up touched up and it was almost time for my photo shoot. While sitting at the lunch table, I noticed something in the corner of the room. There were two hula hoops leaning against the wall. I suddenly knew that there was a little something extra being asked of me today and I was thrilled. I picked them up, gave them a whirl and felt like myself again. We brought the hoops into the room with the photo shoot and got some really fun shots of me hooping in my new, embroidered RWOP apron. Josh was super easy to work with and I had conquered one of my many mountains to come for the long and tiring day. My pre-interview was next. I had my tissues ready, as I saw several of the girls walking out with a few tears in their eyes. We are all SO extremely emotionally invested in this community. Not just because of the competition, but also because of the incredible friendships that have been formed along the way. 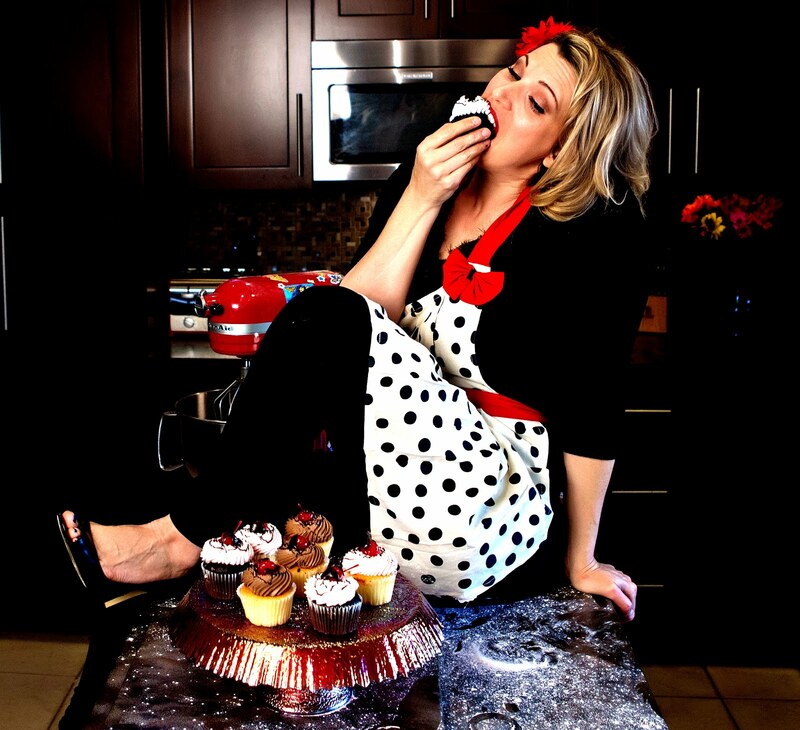 This website, for those of you who don't know or understand, http://www.realwomenofphiladelphia.com/ is like our Facebook for foodies. 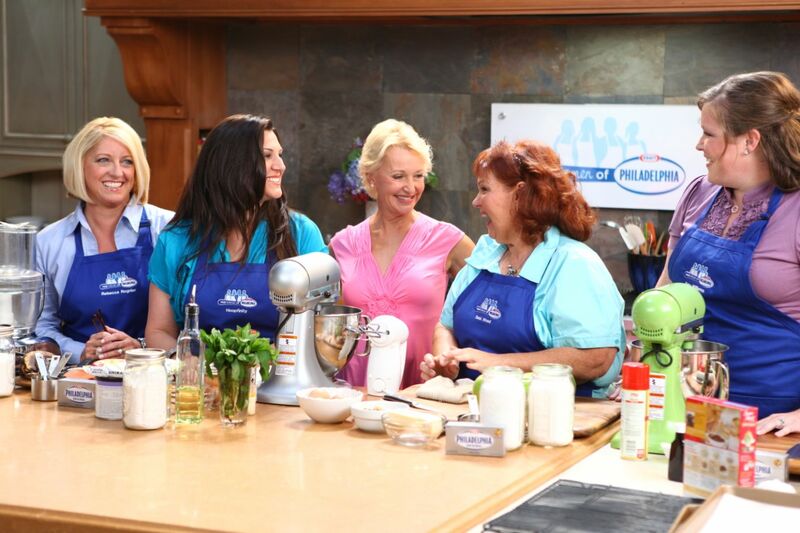 It's a FAMILY of women (and a few men) who have loved, supported, and helped to develop and support everything that we are as home cooks, competitors, and culinary STARS! I entered the interview room with Audie and Jessica. The lights and camera were all set up and I was ready to tell my story. She asked me some questions about the name Hoopfinity and how it came about. I felt very comfortable and relaxed. I was keeping my composure. 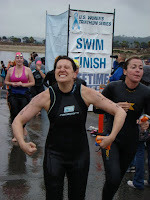 Then she started asking me about doing triathlons. I was fine at first, until I started talking about watching people cross the finish line. 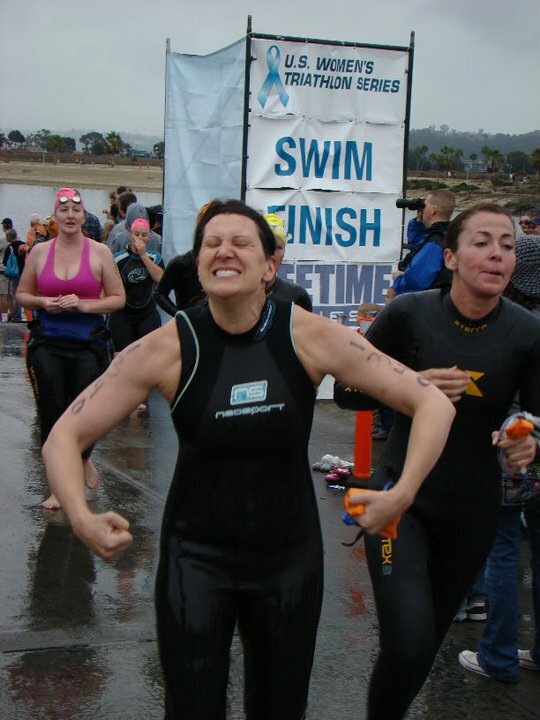 If you've never been to a triathlon, it is so amazing to see people accomplish something so challenging. I talked about how the first time I went to watch Gage, and I saw athletes with one leg, women with small children and people who had lost over 100lbs. on their journey to crossing the finish line. I cried a lot while telling her. More than I wanted to. I felt okay about it, after all it was an interview and it was Audie. I expected to get a little emotional, but I was getting a little worried that the tears were flowing a little too easily today. That energy that was sitting in my stomach was traveling up to my heart quickly and creating what we call "the emotional roller coaster." Soon came our time in the kitchen. I was prepared. I knew that there was something inside me that shifted once it was "show time" and the cameras were on me. 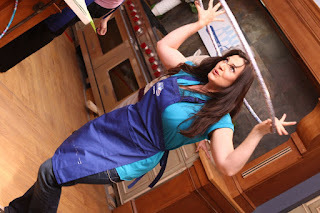 I've always been able to go into performance mode and just cook on camera. I just needed the time to get the dish done the way I wanted it, and the production staff had already made me that promise. I felt great going down the hallway into the studio. 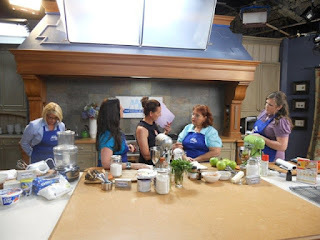 As we walked in, I saw a gorgeous studio kitchen and one of my favorite people in this business, Libbie Summers. I was looking forward to meeting her just as much, if not more than Paula Deen. Libbie is Paula's food stylist and an AMAZING person. I was hoping to just be able to give her a hug, and here she was, briefing us on how she was going to be helping us out today. Her calm demeanor instantly made me feel like I was already a star and that we would have all the time, equipment, tools and ingredients we needed. I felt confident, relaxed and ready. We got set up at our stations and I took a look out past the warm lights and saw the crew. This was amazing! There was a director, a camera crew, tons of photographers and crew members ready to help US film OUR SHOW. We were ready, and somehow my hula hoops had even made it on to the set. We got underway and we were all doing great. We talked on camera, we all had smiles on our faces, our dishes were coming out perfectly. Matt, our director kept the conversation going by asking us all a few questions while we were cooking and everyone got their dishes into the oven or into the refrigerator on time. 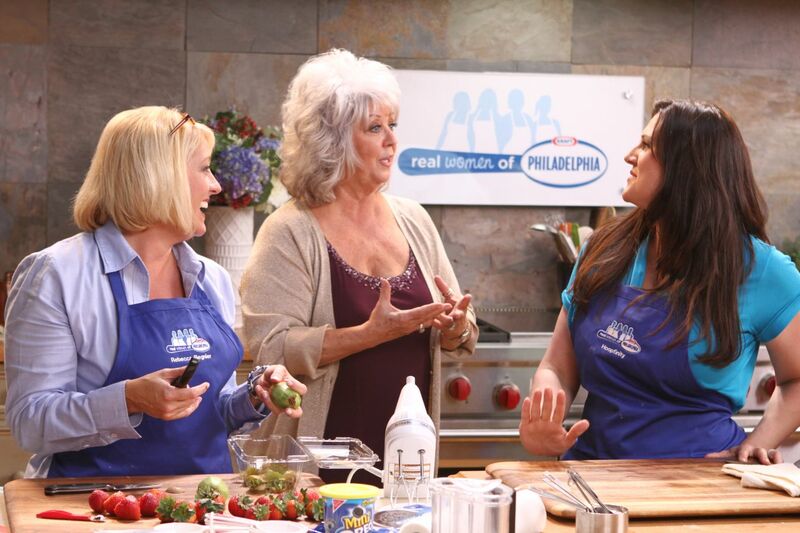 Soon Miss Paula Deen walked onto the set and the show suddenly went up a notch. We all had our game faces on, spoke eloquently and professionally. It was as if we had all been doing television for years. She got over to me and when it came time to talk about my dish, I was empty handed. My Quadruple B's were already getting happy in the oven, so we improvised. We started joking about how my dish (which wasn't there) was light as air, calorie free and totally invisible. She was hilarious. We moved onto the subject of hooping and then it was time. She wanted to see it. On camera! 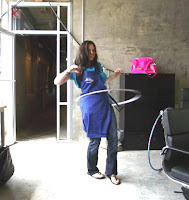 We walked over to the hoops, I gave her a quick demo and then handed the hoop to her. I was about to teach Paula Deen how to hoop! She enthusiastically put the hoop around her waist, followed my instructions perfectly and gave it a whirl. She did great. She got a couple of revolutions in and then the hoop slowly fell to the ground. She kept a huge smile on her face, thanked me for the lesson and my life suddenly felt like it had reached a new high. Now, it was time to check on my dish. What came next would change the entire outcome of this trip. I'll need to back pedal for a second to bring you up to speed. When my dish was ready for baking, I walked over the to the oven that had been so graciously pre-heated for me. There were two ovens, one on top of the other. The top oven light was on, and when I put my dish in, I felt the oven's warmth as I carefully placed the dish on the center rack. I walked away happily and had my visit with Paula Deen. When I walked back over to the oven to check on it, fifteen minutes had passed. It should have been halfway cooked. It wasn't. It was still RAW. At that point, I knew something was wrong, so I began looking up at the control panel to see if I could see the problem. I found it. The control panel read "LOWER OVEN ON." My heart sank into my stomach as I realized I had put the dish in the WRONG OVEN! My first thought was heartbreaking, but necessary. "I'm out. That's it. I can't finish." I knew that we had a "few" extra minutes available to us if we needed it, but I knew there was no way they were going to hold up production for an extra fifteen to twenty minutes so that I could correct my EPIC FAILURE. I called for a production assistant and she came running up instantly. She confirmed that the upper oven that I had been using was not turned on. The heat I felt at the beginning was residual heat from the lower oven that had risen up to the top, giving the illusion that it had been pre-heated. She instantly apologized (which wasn't necessary) and asked me what I wanted to do. We decided to just put the dish in the lower oven and let it cook as much as it could. The cameras continued to roll, so I kept my smiling face on, even though I was dying inside. I thought back to all the episodes of Food Network's "Challenge" that I had watched and I knew that in cook-offs this is just something that happens. It's just a risk you take when you're in a strange kitchen. Anything and everything could go wrong and sometimes its just in the hands of the Universe. It just wasn't my day, so I decided to just help my girls and give them my support. Libbie Summers then came to my rescue. I can honestly tell you that if it had not been for her, I would have probably died right there on the set. She asked me to explain what had happened, I calmly told her, and she asked me how much time I needed. Forty-four minutes is what I needed. There were about twenty-eight left in the cook-off. She assured me at that time I was going to have all the time I needed to finish. Director, Matt Seigel, then informed the entire crew that we were going to have a little more time so that I could finish and I suddenly felt all that energy, once again, shoot up from my stomach into my heart. I managed to hold off the tears for now since the cameras were still rolling, but I knew that I owed these people my LIFE. I ran back to make-up for a touch up, as I was literally "melting" on the set. By the time I came back, my dish was PERFECTLY cooked and I took it from the oven. I let it sit for 5 minutes like I wanted to and plated up my first serving for photography. Matt had decided that we would have the production staff plate the rest of my dishes to save time and to keep the ice cream on the plates from melting. I was free to go, the dish was perfect, and the plates were done. I did it, but not without the help of an incredible team. I immediately went in for a post cook-off interview and told Audie the story of what had just happened. Audie was all ears and the camera was barely noticeable. Again, I held it together mentally for most of the time, until the very end when I was describing how the team jumped to my rescue and came together like magic. I cried just a little, but I was starting to see a disastrous pattern developing. I was becoming a blubbering idiot. I was rushed back to the waiting room for final judging, waited about five minutes and then was called back on to the set. I walked back on and immediately saw Paula Deen and the other three judges sitting at their table with my Quadruple B's, perfectly plated in front of them with several bites missing from each. Paula Deen was eating my food! The directors and producers quickly got me into place and prepared me for the shot. I had practiced my speech a million times in my head and even in front of my friends, but when it came time for me to speak, all the joy, nerves, stress and emotions finally came to a head, and I cracked. I managed to get my name and where I was from out of my mouth, but the tears came as soon as I said the name of my dish. I had to apologize for my breakdown and tried to pull it together, but I was so focused on stopping the water works, my words sounded like I was reading them off of a cue card. The judges had nothing but wonderful things to say about my dish, and I could feel their compassion and slight discomfort as I staggered through my words. Matt once again helped me re-gain my composure by asking me to tell them about my progression on the website and how I started competing. I managed to get it together thanks to him and ended with a smile on my face, but I knew that we were ALL glad that my judging was over. The four of us dessert finalists finally finished about 9:35 and we all agreed that this day was one of the most beautiful and brutal days of our lives. We were quickly carted off to the Lady & Sons restaurant, Paula Deen's place, where we literally had five minutes to grab a STIFF drink, load up a to-go container with food and chat with our other finalists about our experience. I got back to the room at about 10:10 where Gage once again had managed to get the baby down to sleep for the night. 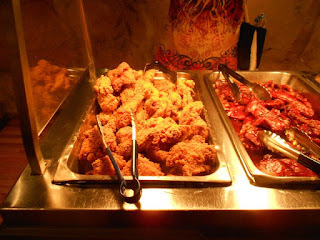 I had grabbed enough food for both of us and we enjoyed some of the most delicious southern food I've ever eaten. Fried chicken, ribs and the most delicious yams we've ever eaten were just a few of the incredible dishes I managed to get my hands on. Gage and I didn't even use utensils. We were like stray dogs devouring our first meal in weeks. I managed to tell him how the day transpired and let the tears flow freely as I spoke. The most important day had come to a close, the stress was off, and now it was time to enjoy the rest of the evening cuddled up to my two favorite men. Not a bad way to end a whirlwind of a day.